As we have seen, the vast majority of invertebrate animals do not possess a defined bony vertebral endoskeleton, or a bony cranium. However, one of the most ancestral groups of deuterostome invertebrates, the Echinodermata, do produce tiny skeletal “bones” called ossicles that make up a true endoskeleton, or internal skeleton, covered by an epidermis. We will start our investigation with the simplest of all the invertebrates—animals sometimes classified within the clade Parazoa (“beside the animals”). This clade currently includes only the phylum Placozoa (containing a single species, Trichoplax adhaerens), and the phylum Porifera, containing the more familiar sponges ((Figure)). The split between the Parazoa and the Eumetazoa (all animal clades above Parazoa) likely took place over a billion years ago. We should reiterate here that the Porifera do not possess “true” tissues that are embryologically homologous to those of all other derived animal groups such as the insects and mammals. This is because they do not create a true gastrula during embryogenesis, and as a result do not produce a true endoderm or ectoderm. But even though they are not considered to have true tissues, they do have specialized cells that perform specific functions like tissues (for example, the external “pinacoderm” of a sponge acts like our epidermis). Thus, functionally, the poriferans can be said to have tissues; however, these tissues are likely not embryologically homologous to our own. Sponge larvae (e.g, parenchymula and amphiblastula) are flagellated and able to swim; however, adults are non-motile and spend their life attached to a substratum. Since water is vital to sponges for feeding, excretion, and gas exchange, their body structure facilitates the movement of water through the sponge. Various canals, chambers, and cavities enable water to move through the sponge to allow the exchange of food and waste as well as the exchange of gases to nearly all body cells. There are at least 5,000 named species of sponges, likely with thousands more yet to be classified. The morphology of the simplest sponges takes the shape of an irregular cylinder with a large central cavity, the spongocoel, occupying the inside of the cylinder ((Figure)). Water enters into the spongocoel through numerous pores, or ostia, that create openings in the body wall. Water entering the spongocoel is expelled via a large common opening called the osculum. However, we should note that sponges exhibit a range of diversity in body forms, including variations in the size and shape of the spongocoel, as well as the number and arrangement of feeding chambers within the body wall. In some sponges, multiple feeding chambers open off of a central spongocoel and in others, several feeding chambers connecting to one another may lie between the entry pores and the spongocoel. While sponges do not exhibit true tissue-layer organization, they do have a number of functional “tissues” composed of different cell types specialized for distinct functions. For example, epithelial-like cells called pinacocytes form the outermost body, called a pinacoderm, that serves a protective function similar that of our epidermis. Scattered among the pinacoderm are the ostia that allow entry of water into the body of the sponge. These pores have given the sponges their phylum name Porifera—pore-bearers. In some sponges, ostia are formed by porocytes, single tube-shaped cells that act as valves to regulate the flow of water into the spongocoel. In other sponges, ostia are formed by folds in the body wall of the sponge. Between the outer layer and the feeding chambers of the sponge is a jelly-like substance called the mesohyl, which contains collagenous fibers. Various cell types reside within the mesohyl, including amoebocytes, the “stem cells” of sponges, and sclerocytes, which produce skeletal materials. The gel-like consistency of mesohyl acts like an endoskeleton and maintains the tubular morphology of sponges. The feeding chambers inside the sponge are lined by choanocytes (“collar cells”). The structure of a choanocyte is critical to its function, which is to generate a directed water current through the sponge and to trap and ingest microscopic food particles by phagocytosis. These feeding cells are similar in appearance to unicellular choanoflagellates (Protista). This similarity suggests that sponges and choanoflagellates are closely related and likely share common ancestry. The body of the choanocyte is embedded in mesohyl and contains all the organelles required for normal cell function. Protruding into the “open space” inside the feeding chamber is a mesh-like collar composed of microvilli with a single flagellum in the center of the column. The beating of the flagella from all choanocytes draws water into the sponge through the numerous ostia, into the spaces lined by choanocytes, and eventually out through the osculum (or osculi, if the sponge consists of a colony of attached sponges). Food particles, including waterborne bacteria and unicellular organisms such as algae and various animal-like protists, are trapped by the sieve-like collar of the choanocytes, slide down toward the body of the cell, and are ingested by phagocytosis. Choanocytes also serve another surprising function: They can differentiate into sperm for sexual reproduction, at which time they become dislodged from the mesohyl and leave the sponge with expelled water through the osculum. Watch this video to see the movement of water through the sponge body. The amoebocytes (derived from stem-cell-like archaeocytes), are so named because they move throughout the mesohyl in an amoeba-like fashion. They have a variety of functions: In addition to delivering nutrients from choanocytes to other cells within the sponge, they also give rise to eggs for sexual reproduction. (The eggs remain in the mesohyl, whereas the sperm cells are released into the water.) The amoebocytes can differentiate into other cell types of the sponge, such as collenocytes and lophocytes, which produce the collagen-like protein that support the mesohyl. Amoebocytes can also give rise to sclerocytes, which produce spicules (skeletal spikes of silica or calcium carbonate) in some sponges, and spongocytes, which produce the protein spongin in the majority of sponges. These different cell types in sponges are shown in (Figure). Simple sponge body plan and cell types. 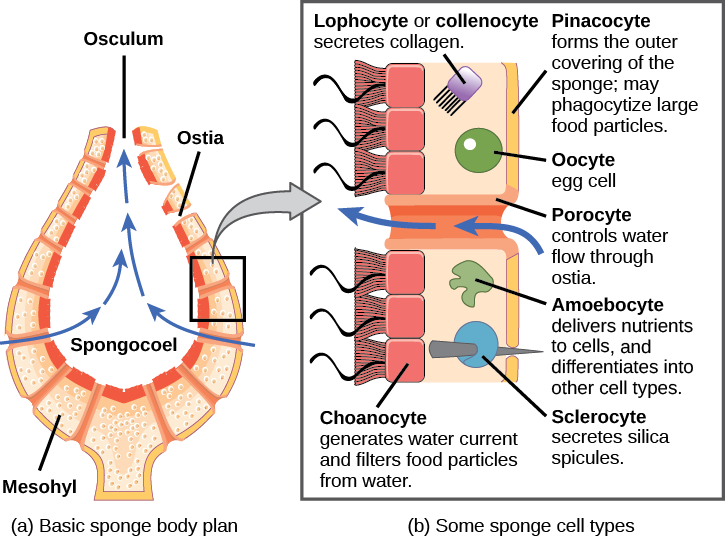 The sponge’s (a) basic body plan and (b) some of the specialized cell types found in sponges are shown. Take an up-close tour through the sponge and its cells. As we’ve seen, most sponges are supported by small bone-like spicules (usually tiny pointed structures made of calcium carbonate or silica) in the mesohyl. Spicules provide support for the body of the sponge, and may also deter predation. The presence and composition of spicules form the basis for differentiating three of the four classes of sponges ((Figure)). Sponges in class Calcarea produce calcium carbonate spicules and no spongin; those in class Hexactinellida produce six-rayed siliceous (glassy) spicules and no spongin; and those in class Demospongia contain spongin and may or may not have spicules; if present, those spicules are siliceous. Sponges in this last class have been used as bath sponges. Spicules are most conspicuously present in the glass sponges, class Hexactinellida. Some of the spicules may attain gigantic proportions. For example, relative to typical glass sponge spicules, whose size generally ranges from 3 to 10 mm, some of the basal spicules of the hexactinellid Monorhaphis chuni are enormous and grow up to 3 meters long! The glass sponges are also unusual in that most of their body cells are fused together to form a multinucleate syncytium. Because their cells are interconnected in this way, the hexactinellid sponges have no mesohyl. A fourth class of sponges, the Sclerospongiae, was described from species discovered in underwater tunnels. These are also called coralline sponges after their multilayered calcium carbonate skeletons. Dating based on the rate of deposition of the skeletal layers suggests that some of these sponges are hundreds of years old. Use the Interactive Sponge Guide to identify species of sponges based on their external form, mineral skeleton, fiber, and skeletal architecture. Sponges lack complex digestive, respiratory, circulatory, and nervous systems. Their food is trapped as water passes through the ostia and out through the osculum. Bacteria smaller than 0.5 microns in size are trapped by choanocytes, which are the principal cells engaged in feeding, and are ingested by phagocytosis. However, particles that are larger than the ostia may be phagocytized at the sponge’s surface by pinacocytes. In some sponges, amoebocytes transport food from cells that have ingested food particles to those that do not. In sponges, in spite of what looks like a large digestive cavity, all digestion is intracellular. The limit of this type of digestion is that food particles must be smaller than individual sponge cells. Some sponges host green algae or cyanobacteria as endosymbionts within archeocytes and other cells. It may be a surprise to learn that there are nearly 150 species of carnivorous sponges, which feed primarily on tiny crustaceans, snaring them through sticky threads or hooked spicules! Although there is no specialized nervous system in sponges, there is intercellular communication that can regulate events like contraction of the sponge’s body or the activity of the choanocytes. Sponges reproduce by sexual as well as asexual methods. The typical means of asexual reproduction is either fragmentation (during this process, a piece of the sponge breaks off, settles on a new substrate, and develops into a new individual), or budding (a genetically identical outgrowth grows from the parent and eventually detaches or remains attached to form a colony). An atypical type of asexual reproduction is found only in freshwater sponges and occurs through the formation of gemmules. Gemmules are environmentally resistant structures produced by adult sponges (e.g., in the freshwater sponge Spongilla). In gemmules, an inner layer of archeocytes (amoebocytes) is surrounded by a pneumatic cellular layer that may be reinforced with spicules. In freshwater sponges, gemmules may survive hostile environmental conditions like changes in temperature, and then serve to recolonize the habitat once environmental conditions improve and stabilize. Gemmules are capable of attaching to a substratum and generating a new sponge. Since gemmules can withstand harsh environments, are resistant to desiccation, and remain dormant for long periods, they are an excellent means of colonization for a sessile organism. Sexual reproduction in sponges occurs when gametes are generated. Oocytes arise by the differentiation of amoebocytes and are retained within the spongocoel, whereas spermatozoa result from the differentiation of choanocytes and are ejected via the osculum. Sponges are monoecious (hermaphroditic), which means that one individual can produce both gametes (eggs and sperm) simultaneously. 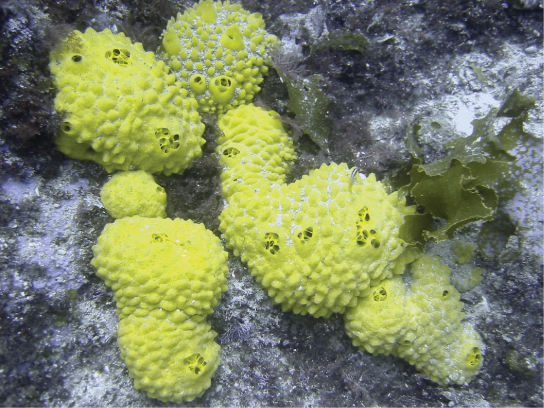 In some sponges, production of gametes may occur throughout the year, whereas other sponges may show sexual cycles depending upon water temperature. Sponges may also become sequentially hermaphroditic, producing oocytes first and spermatozoa later. This temporal separation of gametes produced by the same sponge helps to encourage cross-fertilization and genetic diversity. Spermatozoa carried along by water currents can fertilize the oocytes borne in the mesohyl of other sponges. Early larval development occurs within the sponge, and free-swimming larvae (such as flagellated parenchymula) are then released via the osculum. Sponges are generally sessile as adults and spend their lives attached to a fixed substratum. They do not show movement over large distances like other free-swimming marine invertebrates. However, sponge cells are capable of creeping along substrata via organizational plasticity, i.e., rearranging their cells. Under experimental conditions, researchers have shown that sponge cells spread on a physical support demonstrate a leading edge for directed movement. It has been speculated that this localized creeping movement may help sponges adjust to microenvironments near the point of attachment. It must be noted, however, that this pattern of movement has been documented in laboratories, it remains to be observed in natural sponge habitats. Animals included in phylum Porifera are parazoans because they do not show the formation of true embryonically derived tissues, although they have a number of specific cell types and “functional” tissues such as pinacoderm. These organisms show very simple organization, with a rudimentary endoskeleton of spicules and spongin fibers. Glass sponge cells are connected together in a multinucleated syncytium. Although sponges are very simple in organization, they perform most of the physiological functions typical of more complex animals. a polysaccharide gel and dead cells. a collagen-like gel and suspended cells for various functions. spicules composed of silica or calcium carbonate. Most sponge body plans are slight variations on a simple tube-within-a-tube design. Which of the following is a key limitation of sponge body plans? Sponges lack the specialized cell types needed to produce more complex body plans. The reliance on osmosis/diffusion requires a design that maximizes the surface area to volume ratio of the sponge. Choanocytes must be protected from the hostile exterior environment. Spongin cannot support heavy bodies. Describe the different cell types and their functions in sponges. Pinacocytes are epithelial-like cells, form the outermost layer of sponges, and enclose a jelly-like substance called mesohyl. In some sponges, porocytes form ostia, single tube-shaped cells that act as valves to regulate the flow of water into the spongocoel. Choanocytes (“collar cells”) are present at various locations, depending on the type of sponge, but they always line some space through which water flows and are used in feeding. Describe the feeding mechanism of sponges and identify how it is different from other animals. The sponges draw water carrying food particles into the spongocoel using the beating of flagella on the choanocytes. The food particles are caught by the collar of the choanocyte and are brought into the cell by phagocytosis. Digestion of the food particle takes place inside the cell. The difference between this and the mechanisms of other animals is that digestion takes place within cells rather than outside of cells. It means that the organism can feed only on particles smaller than the cells themselves. Phylum Porifera by OpenStax Biology 2nd Edition is licensed under a Creative Commons Attribution 4.0 International License, except where otherwise noted.